When a major Arab state would finally sign a peace treaty with Israel, it was long assumed, the Arab-Israeli conflict would end. The Egypt-Israel peace treaty of 1979, however, buried that expectation; it had the perverse effect of making other states and also the Egyptian populace more anti-Zionist. The 1980s gave birth to a hope that, instead, Palestinian recognition of Israel would close the conflict. The total failure of the 1993 Declaration of Principles (also known as the Oslo Accords) then buried that expectation. 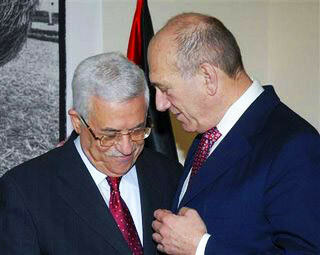 Ehud Olmert (right) demanded, without success, that Mahmoud Abbas recognize Israel as the Jewish state. What now? Starting about 2007, a new focus has emerged, of winning acceptance of Israel as a sovereign Jewish state. Israel's former prime minister Ehud Olmert set the terms: "I do not intend to compromise in any way over the issue of the Jewish state. This will be a condition for our recognition of a Palestinian state." Olmert was Israel's worst prime minister but he got this one right. Arab-Israeli diplomacy has dealt with a myriad of subsidiary issues while tiptoeing around the conflict's central issue: "Should there be a Jewish state?" Disagreement over this answer – rather than over Israel's boundaries, its exercise of self defense, its control of the Temple Mount, its water consumption, its housing construction in West Bank towns, diplomatic relations with Egypt, or the existence of a Palestinian state – is the key issue. Palestinian leaders responded, with howls of outrage, declaring that they "absolutely refused" to accept Israel as a Jewish state. They even pretended to be shocked at the notion of a state defined by religion, although their own "Constitution of the State of Palestine," third draft, states that "Arabic and Islam are the official Palestinian language and religion." Olmert's efforts went nowhere. If Palestinian politicians reject Israel's Jewish nature, what about the Palestinian and the broader Arab and Muslim publics? Polls and other evidence suggest a long-term average of 20 percent acceptance of Israel, whether in the Mandatory period or now, whether Muslims in Canada or Palestinians in Lebanon. The results: 26 percent of Egyptians and 9 percent of urban Saudi subjects answered (in November 2009) in the affirmative, as did 9 percent of Jordanians and 5 percent of Lebanese (in April 2010). The polls reveal broad consensus across such differences as occupation, socio-economic standing, and age. For no discernable reason, more Egyptian women and Saudi and Jordanian men accept a Jewish Israel than their gender counterparts, whereas among the Lebanese both sexes rank similarly. Some significant variations exist, however: as one would expect in Lebanon, 16 percent of (largely Christian) North Lebanon accepts a Jewish Israel in contrast to just 1 percent in the (mostly Shi'ite) Bekaa Valley. More significantly, weighting these responses by the size of their populations (respectively, 79, 29, 6, and 4 million) translates into an overall average of 20 percent acceptance of Israel's Jewishness – neatly confirming the existing percentage. Although 20 percent constitutes a small minority, its consistency over time and place offers encouragement. That one-fifth of Muslims, Arabs, and even Palestinians accept Israel as a Jewish state suggests that, despite a near-century of indoctrination and intimidation, a base for resolving the Arab-Israeli conflict does exist. Would-be peacemakers must direct their attention to increasing the size of this moderate cohort. 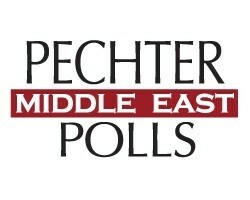 Getting from 20 percent to, say, 60 percent would fundamentally shift the politics of the Middle East, displacing Israel from its exaggerated role and releasing the peoples of this blighted region to address their real challenges. Not Zionism but such, oh, minor problems as autocracy, brutality, cruelty, conspiracism, religious intolerance, apocalypticism, political extremism, misogyny, slavery, economic backwardness, brain drain, capital flight, corruption, and drought. May 11, 2010 addendum: This article follows on an earlier one by me, "Accept Israel as the Jewish State?" In addition, I maintain a long, updated blog on this topic, "Recognizing Israel as the Jewish State: Updates."